I won’t begrudge Florida aviators their 300-odd VFR days a year or give them crap about the days I spend under 800-foot freezing overcasts here in Michigan. And it’s because of days like yesterday. Just look at that sky! 15-20 F on the ground. Scattered at 3,500. Visibility unlimited. The airplane climbs like crazy. Lots of air molecules very close together. Note the superior service here. Line tug and everything. I can finally say that I got a pushback! Went through a Biannual Flight Review (BFR) yesterday. Even though the instrument rating in October essentially counts as a BFR, I hadn’t flown for any material amount of time VFR for a long time and I wanted to get some stalls, slow flight, takeoffs, landings, etc. in with an instructor in the right seat. Pattern work at Lapeer (KD95). 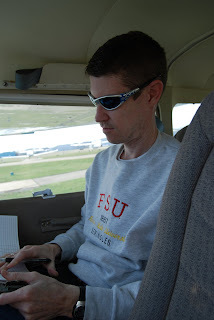 Then I put on the hood and we went over to KFNT for the ILS 27 and then the RNAV 18. Did very well on each of the approaches, even with 20+ knot crosswind on the ILS. Here’s a shot of the two aircraft that I have flown the most of late. N16TA and N20TA. 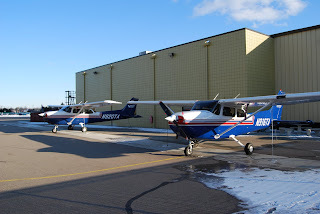 They’re the two newest of the Tradewinds fleet other than N15TA, the G1000-equipped aircraft. Got to go over and check out Flight 101 sometime in the next few weeks and make sure that I have a place to rent. Might be dun to get checked out in the C-152 again and also fly the DA40s. For now, though, I’m current for everything other than night landings and that’s pretty good for me this early in the year. I’d consider throwing all of my approach plates in the lake at this point, but I fear that, even with dual VORs, IFR-certified GPS, and vectors, I’d have trouble finding the lake. I had my final stage check this afternoon – well, most of it. 2.1 under the hood with rapid-fire changes of clearance, two holds (one VOR and one at an airway waypoint), a DME arc, unusual attitude recoveries (both full and partial panel), compass turns, approach and departure stalls under the hood, and a takeoff under the hood. That’s f%&$ing work! I was a noodle by the end. My check pilot (the senior training pilot at Tradewinds) had a headset malfunction when the portion near the plug separated and made it tough for him to hear. So we shouted at each other for most of the maneuvers (par for the course on some of my flights, even when the instructor’s headset is fully funcitonal) and packed it in at the end. We’ll do the approaches and clean up the other stuff soon. Gotta go fly some sim between now and then, especially partial-panel approaches. Here’s N916TA, a Cessna 172R in which I’ve probably logged 20-30 hours. It and its sister aircraft, N920TA, have two-axis autopilots and an audio Aux input (great for iPod addition to your avionics). 16 and 20 are contemporaries of N918TA, the subject of the So Long, One-Eight! episode. Nice aircraft and none older than 2002. N915TA is a glass-panel (Garmin G-1000) is also on the line, but I’m going to finish up the rating with the steam gages and then maybe transition. Wonder why I like Tradewinds? Here’s my walk from the lobby to the Pilot Center flight line. Right past the King Airs and the Hawkers. Got to like that. And look at the floor! Could you eat off of that or what? Last thing: I’m the guest on Episode 3 of The Pilot’s Flight PodLog, which you’ll recall is Will Hawkins’ new podcast. Check it out and subscribe to Will’s new podcast at iTunes or your favorite other podcatcher or listen online at http://media.libsyn.com/media/pilotwill/pilots_flight_podcast_3.mp3. Subscribe to Airspeed through iTunes or your other favorite podcatcher using the feed http://airspeed.libsyn.com/rss or listen to audio at http://airspeed.libsyn.com. This episode is the first in a series that will run through spring. No yet idea how many episodes will be in the series or exactly what the content will be, but we know this: Spring will be here soon and with it the best time of year in the Northern Hemisphere to learn to fly. And, for that matter, there’s still a lot of good flying weather left for those listeners in the Southern Hemisphere. 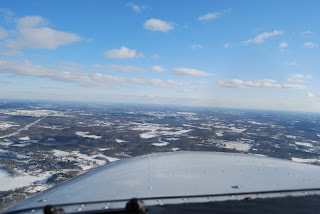 If you’ve never been up in a general aviation airplane – or if you have, but haven’t yet made the decision to start flight training in earnest, these episodes are for you. They’re also for people who have started training on a certificate or rating but, for whatever reason, have stopped training. I know exactly what I’m talking about here. 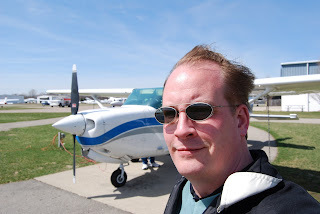 I didn’t start flight training until my mid thirties. 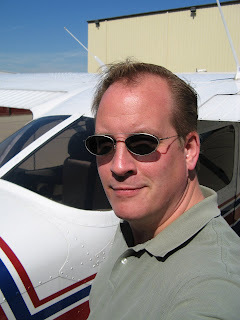 I had a year-long hiatis in my training for the private pilot certificate when my son was born. And I always seem to have a hiatis toward the end of the year because my law practice tends to get very busy at that time of the year. Case in point, I’m probably four or five flights away from the instrument rating in a Part 141 program, but I’m almost embarassed to say how long it’s been since I was last at the flight controls of anythng other than a Frasca 142 simulator – mainly because the weather hasn’t been flyable, I’m slammed at work, and I have a couple of great kids that justifiably demand my attention. But this is the year. I’m going to polish off the instrument rating. And if you have unfinished business at the airport – or have yet to start that business, the time is either now or very soon. So we’re doing a few episodes to give you the motivation and drive to get to the airport – or get back to the airport, as the case may be. And what better way to start than to bring you John and Martha King. John and Martha King are two of the best-known flight instructors and aviation advocates in the world. 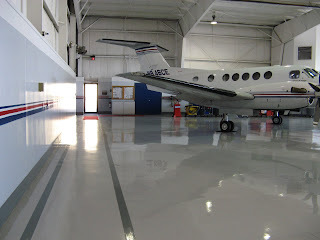 Starting in the early 1970s, they have built a business that has grown into an 18,000 square-foot complex in San Diego and reaches to every corner of the general aviation world through mail order, multimedia training, and personal appearances. Not to mention at least one podcast episode. The Kings’ bios would take at least 2o minutes to try to completely cover (I know – I tried), so we’re just going to hit the highlights here. 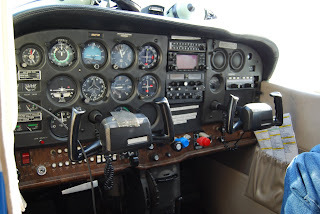 Each holds every single category and class of FAA pilot and instructor certificate. Each of them continues to be active in many categories, regularly flying everything from jet and piston airplanes and helicopters to weight-shift trikes and powered parachutes. They even serve as backup pilots for the Fujifilm blimp. They lecture widely and make many public appearances. You may guess from some prior episodes that it was tough to get access to the people I’ve interviewed and you’d be right in some cases. Not so with the Kings. I was on the phone with then very quickly after requesting the interview. Lots of aviation icons talk a good game at the big events about being champions of general aviation and aerospace education, but the Kings put their day-to-day time and energy where their reputations are. 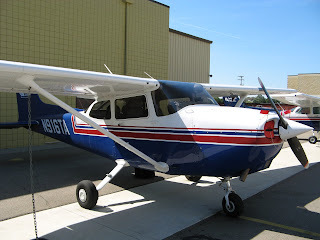 Lastly, I should tell you that I’ve been through the Cessna Pilot Center (or “CPC”) series of CD-ROM training courses for both private and instrument pilot. Those programs featured the Kings heavily, in addition to Rod Machado and others. Even though I had already been through a private ground school in a Part 141 program before taking the CPC courses, I learned new things from the CPC courses and developed a better understanding of the things I already knew. 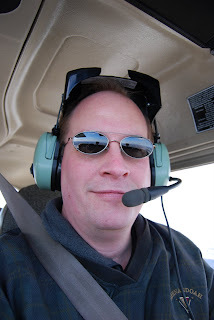 I have not been through other multimedia courses except a but of the ASA instrument DVDs, and can say little one way or another about other courses, but I was already a pretty sophisticated consumer as private pilot training materials went, and found the Kings’ materials very effective. Anyway, on to the interview with John and Martha King. Thanks to John and Martha King for appearing on Airspeed. You can find more information about John and Martha and about King Schools at www.kingschools.com. There’s a link in the show notes at www.airspeedonline.blogspot.com to the article that I mentioned: Battling the “Big Lie:” John King’s Crusade to Change Aviation’s Culture. It’s definitely worth a read by every pilot and by every every pilot’s family and friends who have questions about safety in general aviation. One other thing. I make it a point of telling you guys when I have anything that comes close to a conflict of interest. Like the episode about ballistic recovery parachutes where I disclosed my small stock holding in BRS Parachutes. One could be forgiven for thinking that my enthusiasm about the Kings is motivated by some advertising deal. But I received no promotional consideration from King Schools or anyone connected in any way with the Kings for this episode. None asked and none offered. Their materials are just that good and their generosity with their time is just that . . . well, generous. There might be better training materials out there – and you should avail yourself of whatever works for you – but I was really happy with my experience with the Kings’ materials and you probably would be, too. 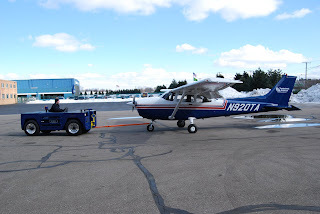 It’s all about what makes your flight training experience most productive and what gets people up in the air sooner, more safely, and so inspired after each lesson that they spend five minutes in the parking lot of the flight school trying to figure out which key unlocks the car. Yeah, it can be that way sometimes. And it can be that way soon if you get yourself to the airport and take the first – or the next – step. Lastly – and I’ll get to this more in depth in a future episode – the best first step in pursuing pilot training is to visit www.beapilot.com. You can obtain a certificate right then and there that’s good for your first flight lesson for $99 or less at any of about 2,000 flight schools that participate in the program.